This is Patch he is a teddy with a difference. I wanted to make something that had some bright colours in it but could not find exactly what I was looking for. I used the pattern from this site Joyful Toys. Benny Bunny was made using the pattern from here as well. 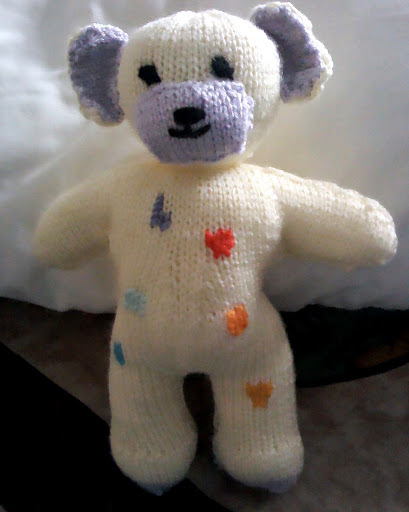 I made a few modifications like adding a waist and the patches on the teddy. I added a waist to Patch so he will be easy for little hands to get hold of. The patches were sewn in over the knitted stitch, it is called Swiss Darning it was my first attempt at this and turned out ok. I may try it on other projects later on like a cushion cover but that will be after I have finished making things for my Grandchild who will arrive in June.